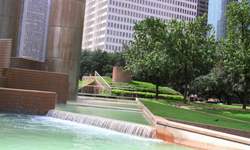 Tranquillity Park is one of Downtown Houston’s most recognizable addresses, located across Walker Street from City Hall and across Bagby Street from the Hobby Center. 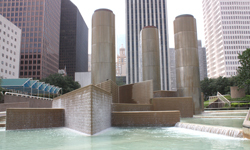 In its center is a modern, angular fountain complex, of which its most visual elements are several tall towers from which water flows to the fountain pool. 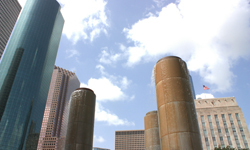 Built in 1979, the park and its signature fountain complex take Houston’s connection to NASA and the aerospace industry as their focus. 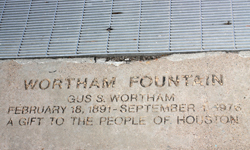 Tranquillity Park is the work of Houston architect Charles Tapley.